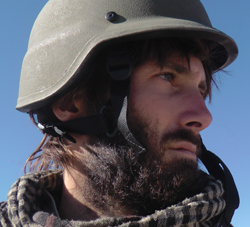 Veteran of the Libyan Revolution, former prisoner of war, founder of Sons of Liberty International, International Security analyst, media commentator, public speaker, Huffington Post blogger, and award-winning filmmaker and writer Matthew VanDyke has had extraordinary experiences in some of the world's most dangerous places. He has driven motorcycles in warzones, explored the vast reaches of the Sahara desert, fought in the 2011 Libyan Civil War to overthrow Muammar Gaddafi, directed the documentary film about Syria, Not Anymore: A Story of Revolution, and founded the first military contracting firm run on a non-profit model. Some of his experiences are featured in a documentary film about his life titled Point and Shoot, which won the Best Documentary Award at the 2014 Tribeca Film Festival. Matthew VanDyke's firm, Sons of Liberty International, operates on a non-profit model to provide free security and military consulting and training to communities fighting terrorism, insurgency, and oppressive regimes. The company is run on a non-profit model and relies on the public's support to fight terrorism. You can also leave comments for Matthew VanDyke on the Facebook Page. Matthew VanDyke's documentary film about the conflict in Syria, Not Anymore: A Story of Revolution, has won over 100 awards, has been screened in more than 200 film festivals in over 20 countries, and has been seen by millions on television. Click here to watch the entire 15 minute film! The Freedom Fighter Blog contains personal accounts of VanDyke's ongoing mission to combat authoritarianism, and analysis and commentary of current events surrounding the struggle for freedom worldwide. The Freedom Fighter Blog won the 2012 Defence IQ Blogging Award in the Counter Terrorism category. "Everything a blog should be: informative, interesting, well written, thoughtful and occasionally provocative. VanDyke declared “the 21st century is the century of freedom” – he’s fighting for it with both pen and sword." 6/13/12 - Have the U.S. and Europe Helped Arm and Empower Islamist Militants in Syria?